Guests and staff have reported several things throughout the years, most notably between the hours of 2-4 am. People have often reported seeing the elevators moving from floor to floor with no passengers in them, the inexplicable smell of cigar smoke. In the Devereaux Dining Room, people have reported the smell of perfume and the sounds of dishes being moved around. The apparition of a young girl in Victorian clothing has been seen playing with a ball throughout the hotel. Perhaps the most chilling report is of men being woken up by the apparition of a woman! The screams of a woman are often heard throughout the hotel, believed to be of a chamber maid who was involved in a love triangle, and was murdered by one of her lovers. The room in which the woman was believed to have been murdered was a guestroom, it has now been turned into a storage room, due to the history of paranormal happenings occurring there. 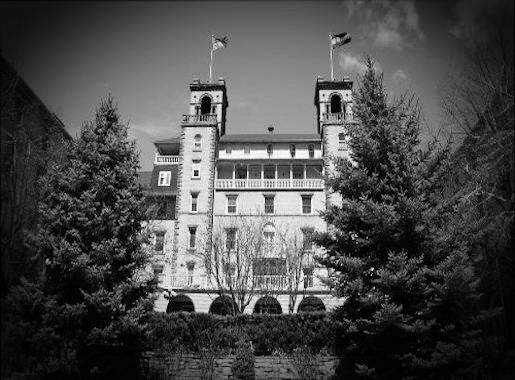 On the third floor activity seems to be the highest, with guests and staff reporting unexplained knocks on doors, apparitions, strange unidentifiable smells, sounds, lights turning on and off in the middle of the night, and TV’s changing channels. A strange story regarding room 551 is told by staff. In 1982, the hotel was undergoing some renovation work, and one of the jobs was to replace the wallpaper in room 551. The following morning after putting up the wallpaper, all the paper had been rolled neatly on the floor. The paper was re-applied, but it was again found on the floor the following day. After a few more attempts, some wallpaper samples were left on the bed overnight. Upon returning to finish the job the following morning, staff found all the samples on the floor, apart from one roll. The sample that was left on the bed was applied to the walls, and there were no more issues with the wallpaper after that! Could this be a ghost unhappy with the choices of colour the hotel manager was making? The Hotel Colorado was built in 1891 and first opened its doors to paying guests in 1893, with 191 rooms that cost as much as $3 per night to stay in the hotels’ most elegant rooms. The construction of the hotel was based on the 16th century Villa de Medici, Italy. It was the very first electrically lit hotel in area, it’s courtyard boasted a large fountain that would shoot water 180 feet in the air. It was a true rich man’s getaway. Its spa and swimming pool fed from the a natural spring was also a big popular feature of the hotel, designed to lure the rich and famous. During its golden years, the hotel played host to famous guests such as Presidents Theodore Roosevelt and William Taft, as well as the “unsinkable” Molly Brown. The hotel became somewhat of hideaway in the 1920’s, for the Chicago gangsters, Jack Alterie, the Verain brothers, and most notably, Al Capone. Carrying on the design of the 16th century Italian architecture of the outside, the Italian flavour continues indoors too, with a 19th century Italian theme running throughout the hotels’ 131 rooms. The guestrooms are elegant and comfortable, with choice of King rooms, Double Queen, Family, or Signature suites, with prices starting from as little as $120. The hotel has a plethora of amenities such as adventure shops, spa packages, and various adventure package deals. To satisfy your appetite the hotel boasts a fine restaurant (Baron’s Restaurant), the Martini Lounge, Courtyard Cafe, Copper Top Bar, and the Legends Coffee Shop. The world famous Glenwood Hot Springs pool is located just across the street from the hotel. Down town in Glenwood Springs, has a host of fine restaurants and bars. If you want to explore the town, there’s also museums, shops, and art galleries a plenty. Glenwood Springs is a recreational paradise. The Sunlight Ski Resort is just minutes away from the hotel. The Glenwood Caverns Adventure Park offers a unique mountain-top adventure that features tours of mystical caverns, rides, tram tours, dining and more. Suites priced from $120 to $600 for the luxury suites. For the latest prices, click here.